All people do their entire life is try to figure out who they are as a person. Many people die trying. As for myself, I can’t say I know the essence of my entirety. My mind and soul and body are on wheels spinning in different directions, sometimes on different continents, it seems… But what I do know is that I understood myself less before I poured into the pages of the Harry Potter series. I’ve found my fingers flipping J.K. Rowling’s pages, becoming lost in the labyrinths of her plots, carried away in the compassion flowing from her characters. As I’m reading this series, all these people see the body of the book, its spine, or the cover between my hands wherever I am. I heard things like: “I read that series in elementary school…” I couldn’t help but feel a flush of red overpower my cheeks and almost feel ashamed for being a seventeen year old reading this series. I kept reading and it was soon that I decided reading this series was the best thing that ever happened to me. Anyone I’ve met that shares an interest and love for this series has felt instantly like family to me. 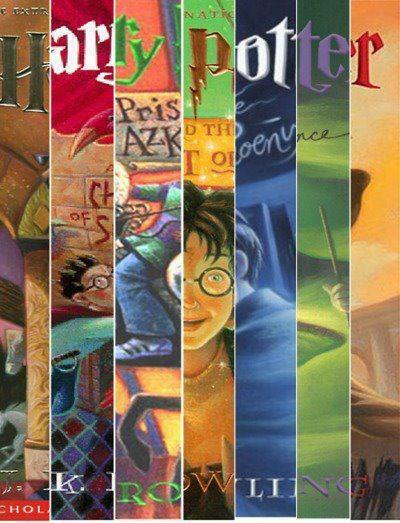 These books hold so much invention and creativity, from creatures such a as hippogriphs and phoenixes, to things like death eaters and giant serpents, to settings of moving staircases and talking portraits…The plethora of uniqueness drips from page to page. Perhaps the love I feel for the Harry Potter books is mostly due to its characters. Like Ginny, I am often shy and quiet around crushes. Every now and then I am the clumsy and unlucky Neville. Sometimes I am the ambitious and overachiever Hermione. I am the animal enthusiast, Hagrid. I am the embarrassed, red cheeked Ron as my parents discuss bills, or my sibling’s triumphs surpass my own. I am the average person who found out they are indeed brave and special and worth something. Someone smart once said “you must love yourself before you can love others”. In a way, finding who I am is a step closer to being able to accept and love myself. I may not live in the world beyond the bricks of 9 and ¾. I may not fly Firebolts and speak to elves like Dobby, but that’s the magic of fiction. I can coexist as myself, in this world, or I can apparite into another world. And to J.K. Rowling, you’ve made a world in which I love the characters, and in return, have found ways to appreciate myself. And so for all the days and nights flipping pages, I give my most real and honest thank you.